As a microprocessor architect, it’s only natural to assume that John Chu’s stories would have a strong technology element. However, it’s Chu’s pairing of technology with real, and oftentimes painful, human emotion that make his work transcendent. His short fiction has appeared in such publications as the Boston Review, Asimov’s Science Fiction and Apex Magazine. His short story, “The Water That Falls From Nowhere” won the 2014 Hugo Award for best short story. As a translator, Chu has helped bring important Chinese voices to the western science fiction and fantasy community. As a writer, Chu’s stories examine issues of family, diversity, culture, and language, all while pushing the genre forward. “Restore the Heart into Love” is a perfect example of his ability to focus on a smaller, tender story while creating an exciting universe that leaves the reader wanting more. Chu is an exciting writer at the beginning of his career and we look forward to seeing more of his work. Uncanny Magazine: “Restore the Heart into Love” draws both on history and current events. The name of the ship, Byzantium Library, echoes the last of the great ancient libraries while the ideology purges call to mind both the Cultural Revolution in China and the current destruction of cultural artifacts by ISIS in the Middle East. What is it about the destruction—and rescuing—of culture that speaks to you so strongly? John Chu: I’ve always loved libraries. For me, they’ve always been my sanctuaries. The idea of destroying them horrifies me, as does the destruction of other cultural artifacts. Note, though, in this case, what’s lost isn’t information. It’s how that information is represented. Also, for a while, what happens is indistinguishable from decay over time. And that’s the other thing that inspired this story. We lose our history and culture so easily. A friend of mine specializes in the restoration of American Musicals. It is painstaking, meticulous work that involves a lot of investigation and conjecture. The goal is to prepare a text that reflects the musical that was performed on its opening night. Sometimes, though, so much has been lost (many times due to benign neglect), that restoration isn’t really possible. Uncanny Magazine: There are lots of terrific science fiction elements in this story but none more compelling than the data retention used on the ship. As a microprocessor architect, you have some experience in this field. What was the process for coming up with the various methods used to store the texts? How grounded in science are they? John Chu: I wrote the first draft towards the end of Clarion. This story was very much the thing I could write without doing any research. I drastically rewrote about half of it after Clarion. While I was doing that, I researched storage media because the rewrite depended on making them seem at least plausible. The storage methods get more realistic and more present day as the story goes on and Max falls back to older technology. What Byzantium Library uses at first isn’t implausible. However, the state of the art would have to improve to get the lifespan and storage density implied by the story. By the end, it’s using what we have right now. 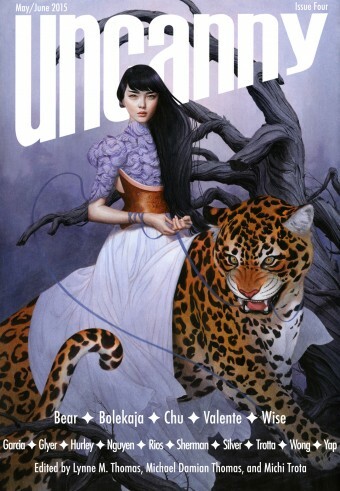 Uncanny Magazine: You are a writer who embraces diversity in fiction without hesitation. Your stories feature the use of Chinese language and issues in the LGBTQ community. Yet there is also a very universal thread of struggling for approval, particularly from a parent, in many of your stories. Why does this speak to you so strongly? John Chu: This story was very much me trying to process my Mom’s death. Jeff VanderMeer quoted me talking about the story in his brilliant book on writing, Wonderbook. As I said there, it took years before I could get myself to write about her death and even then I had to go “Hey look, a spaceship!” every 500 words or so. Otherwise, I simply couldn’t do it. When I think of my Mom, I think of two things: uncompromising standards and beef noodle soup. The story, the scenes on Earth anyway, fall out from there. 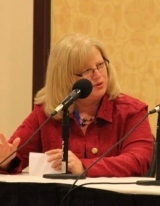 Uncanny Magazine: In a previous interview you not only said that the story idea dictates the form, but that the short story suits your short attention span, citing the science fiction short stories you enjoyed as a boy. What sort of writing or stories influenced you as a child? John Chu: This is embarrassing. Usually, the people who answer this question have read only the best works from birth or something. I started learning English when I was six, and I had no standards. I read indiscriminately and the librarians all knew me. Uncanny Magazine: When did the idea of wanting to be a writer take root? You stated that you didn’t begin speaking English until you were six and that, perhaps, impacted your reading choices. Do you think coming to the English language later in life has had any sort of impact on your writing or how you approach a story? John Chu: I pretty much started writing at about the same time as I started learning English. However, it honestly never occurred to me that I could be a working writer until I found the work of Ted Chiang. The Stories Of Your Life And Others, that brilliant anthology of his first eight stories, literally changed my life. I’m not sure what sort of effect learning English at the age of six has had on my writing. The nice thing about being six is that you pick up languages very quickly with the result that you become more or less bilingual. I’ve always been interested in linguistics and having to learn a new language so early in life might have something to do with that. Switching back and forth between two languages pretty much makes you explicitly aware of at least some of the nuances of each language. If nothing else, that teaches you right away that there are no true synonyms even within one language. I think that concern over shades of meaning and register affects my writing. I’ll leave it to others to decide whether that’s good or bad. Pretty much everything in my life has had some sort of impact on how I approach a story. In this case, over time, I think it’s underlined the importance of language. How a story is told can make or break the story. A lesson that I keep re–learning is that I generally can’t tell the story until I have developed the language the story is written in. I think that’s very much an outgrowth of my relationship with language. Uncanny Magazine: As a writer who is near the beginning of your career, you’ve made quite a splash, winning the Hugo Award in 2014 for your short story Water That Falls on You From Nowhere. You’ve given a lot of credit to the Clarion Science Fiction & Fantasy workshop and the inspiration of your fellow 2010 classmates and instructors. How did that experience sharpen your focus as a writer? Clarion added tools to my toolbox. It gave a rigor and structure to my writing that it desperately needed. Of course, I hadn’t realized that’s what it needed until after I got there. It’s impossible to read the work of my brilliant classmates and instructors and not be inspired to do better. Uncanny Magazine: You wear multiple hats in the genre world, not only writing but also translating fiction and podcasting. Where do you see yourself in 10 years? Is there a dream project you’re working towards? John Chu: Well, I hope that I’m still writing, translating, and podcasting, just much much better than I’m writing, translating, and podcasting now. Right now, I’m taking all of this one day at a time. Uncanny Magazine: Thank you for taking the time to chat with us. We can’t wait to see what comes next.